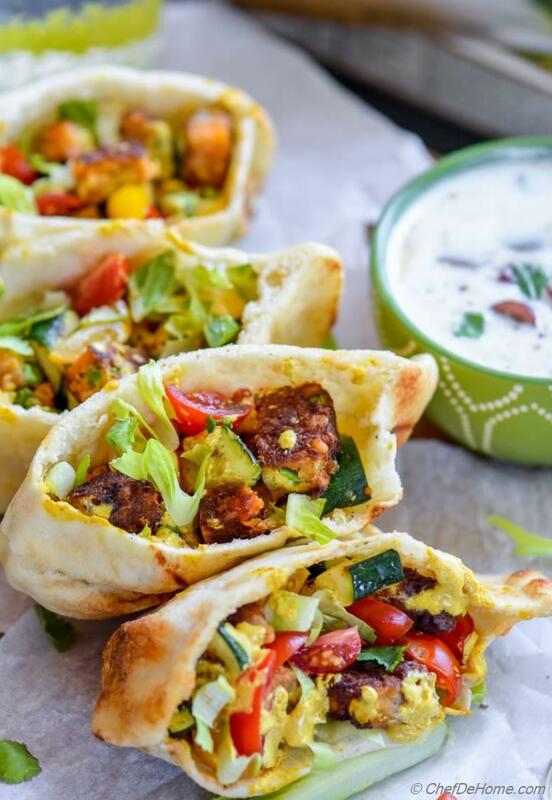 Grilled Indian Naan Pockets filled with grilled Spicy Indian Veggie patties, grilled zucchini, fresh cherry tomatoes, and drizzle of 5-minutes easy curry dressing. Served with cooling grape raita on the side, this Indian meal will be delicious surprise for ALL Vegetarian Guests, in your next get-together! Oh - and if you like Indian Food and always prefer a take-out, these Naan Pockets will change the things!! 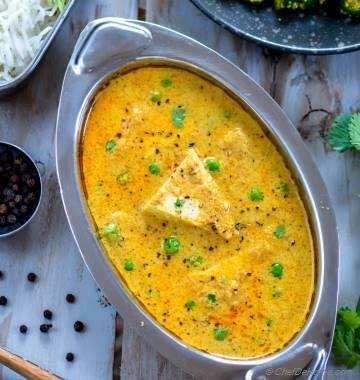 This is, one of the easiest and flavorful Indian Vegetarian Meal, that you can cook in comfort of your own home!! Just 30 minutes (only 15 minutes cooking) and it will fly from your grill to dinner table! 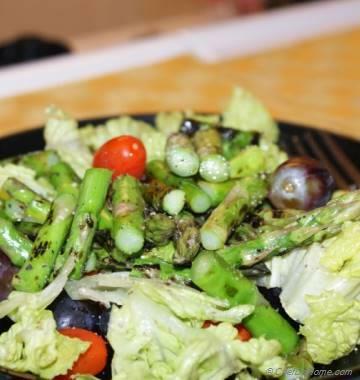 I love to showcase time and again that vegetarian meals can be delicious and bring lots of flavor to your every day dinner and even to parties. Once you take-care to select right ingredients and pair bold-flavors, chances are, your family will finish veggie dishes before anything else! In my home, every party, I have to cater to all guest requests and special dietary needs. Since a lot of my friends are vegetarian..... I always make sure to cook some delicious vegetarian options so that no one feels neglected. Not just vegetarians, vegetarian dishes everyone enjoys! I mean, veggie sides, appetizers, salads, veggie filling for tacos, or naan pockets........ all these finish MUCH quickly in my parties. This was a learning experience for me, really. I'm sure you can relate. In my early days of hosting parties, all of veggie sides would disappear quickly and my vegetarian guests would end-up hungry. So, these days, I have a rule to double the "veggie cuisine", so that all can enjoy! For all such feasts, I prep and plan everything in advance and keep few ready-to-use options in hand. 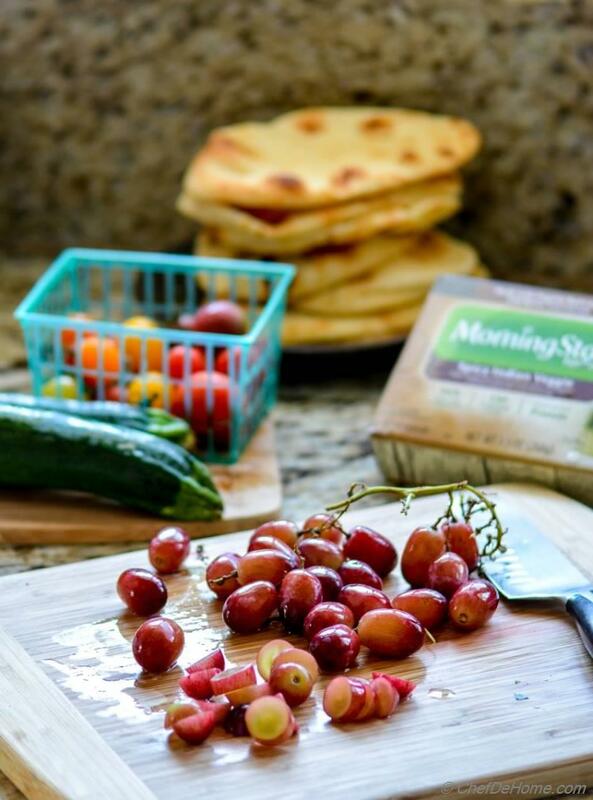 Specially, for grill-outs, I prefer "veggie cuisine" using MorningStar Farms delicious vegetarian products. These provide a healthy option for my guests but still brings great flavor to dishes. Today's Naan Pockets recipe is not just famous in my grill-out parties but also favorite of everyone in my family for a delicious Indian weekday dinner. 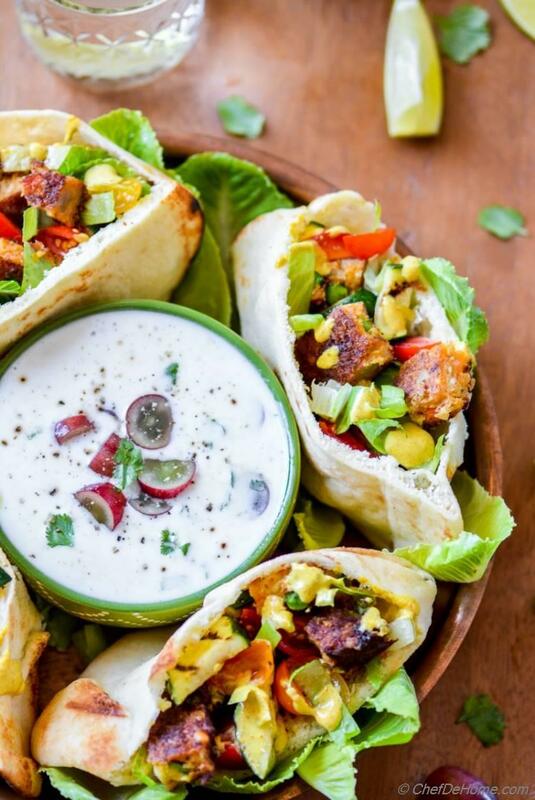 Most, or all of these, can be prepared in advance: grape raita, sweet and spicy Curry Sauce, naan pockets..... And when your guests arrive, all you need to do is grill MorningStar® Farms Spicy Veggie Indian burger patties and veggies, assemble, and serve! MorningStar® Farms offers a wide selection of veggie burgers which really make "veggie cuisine" a STAR of our gill-outs. Not just grill-outs, sometimes, I love using these veggie patties for my meatless Monday dinners too. Friends, just in time for Meatless Monday, I have given you a delicious Vegetarian Naan Pockets recipe to try! And guess what? You can even make it today and serve your family a flavorful, sweet, spicy Indian dinner in no time!! Ditch the delivery, do some groceries while your way home from work and make Veggie Naan Pockets for dinner tonight!! Here are few more Veggie Dinner Ideas from my recipe repertoire! Total Time 30 minutes Prep Time 15 minutes Cook Time 15 minutes Difficulty Easy Yields 8 Medium Naan Pocket Serves 4 Notes No. of servings depends on serving size! Smart Swap Use any veggie or fruit toppings of yours choice. Some cucumber or strawberries are my favorite. 1. 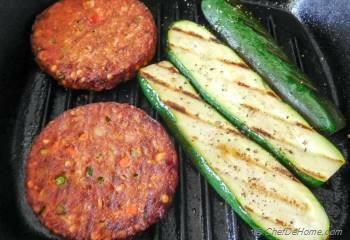 Grill Patties and Zucchini: Preheat outdoor grill or heat an iron griddle and spray with oil. 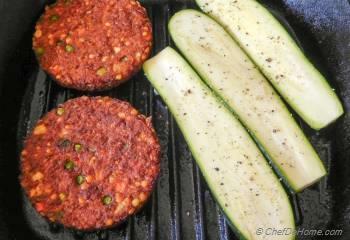 Place MorningStar Farms veggie patties and zucchini on grill. Grill veggie patties until internal temperature registers 160 degrees Fahrenheit. 2. Grill zucchini until nice grill marks appear and is tender per your liking (I like to grill for 2-3 minutes each side). Season with salt and pepper, slice into bite size pieces, and set aside. Also chop tomatoes, romaine lettuce, and grapes, if not already. 3. 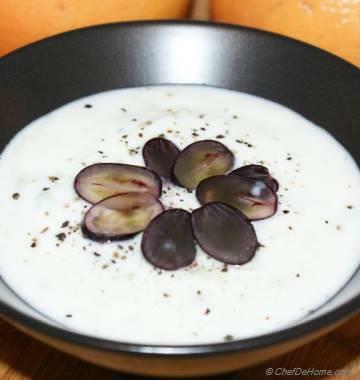 Grape Raita: To make raita, in a bowl, add yogurt with water and whisk to make smooth. Add seasonings, cilantro, and grapes. Mix well. Taste and adjust salt. Cover and refrigerate until ready to use. 4. Curry Dressing: In a small sauce pan, heat 1 tsp oil, add curry powder, stir well, and remove from heat. 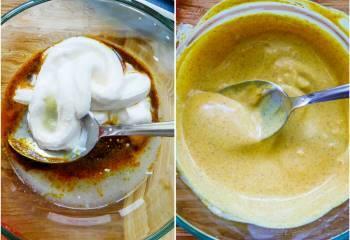 Transfer curry oil mixture to a small bowl with sour cream, water, lemon juice, and honey. Whisk well to combine everything. Taste and adjust salt and honey, if needed. Set aside. 5. Once Patties are ready. Chop into small bite size pieces. 6. Build Naan Pockets and Serve: Spray less hot side of grill with oil. Warm naan pockets on the grill until soft (1-2 minutes). If using small or mini ones, then just slice 1/2 inch from one edge of naan to open up the pocket cavity. 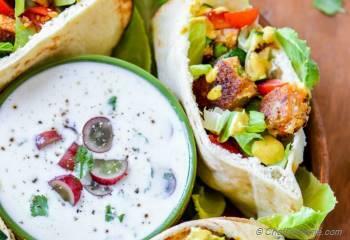 Fill each naan pocket with equals portions of grilled zucchini, cherry tomatoes, lettuce, and chopped patties pieces. Drizzle with some curry dressing and place of a serving platter. Serve with cooling Grape Raita on side. Enjoy! If using big naans, divide in half. Can't find Naan Bread? You can make some at home or even can use Pita Bread to make Pockets. I was really hoping this was made with homemade naan and you didn't disappoint! YAY! This is SO my kind of food! 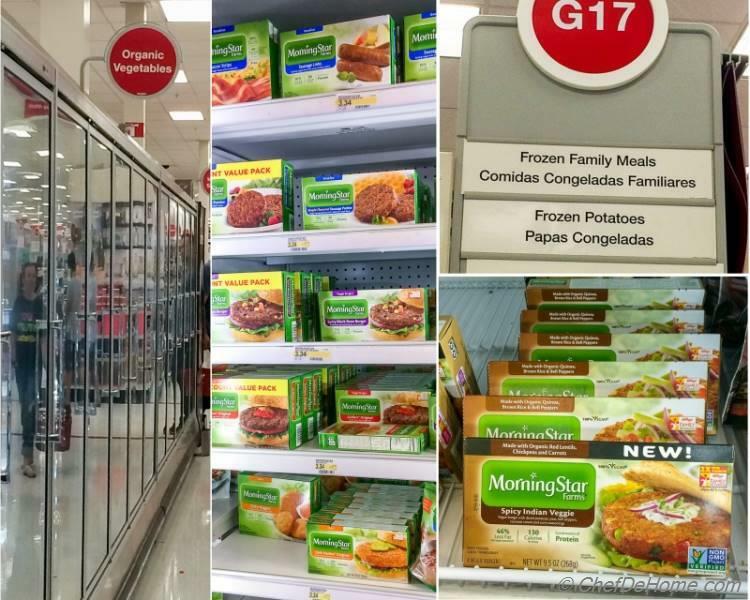 Such a great use of these Morningstar patties! Love the idea! Yummy! Mira, thanks my friend. These MorningStar Farms Patties meant to join these naan pockets with curry dressing :) Really, were delicious together. These naan pockets look delish, Savita! What a great idea especially with the Morningstar Farms patties! Kelly, thanks my friend. I'm glad you like it. 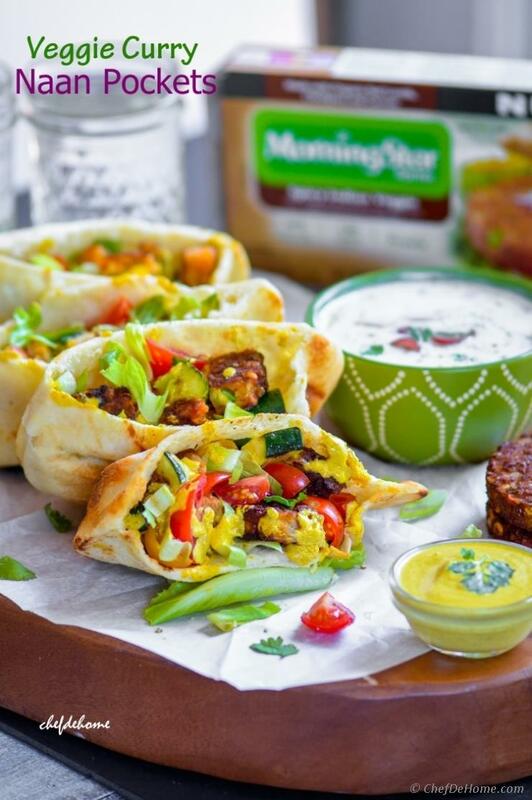 Really, MorningStar Farms patties have delicious Indian spice flavor, were great in naan pockets. 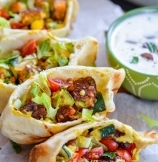 OOh - love your use of MorningStar burgers in these stuffed naan pockets! And that grape raita is making me drool! Shashi, thanks. I'm so pleased you like it. MorningStar Farms burgers are real STARs here. I've never thought about stuffing naan with an awesome veggie curry mixture. I totally want these pockets for lunch today though...and then again for dinner! They look awesome! Gauri, thanks! 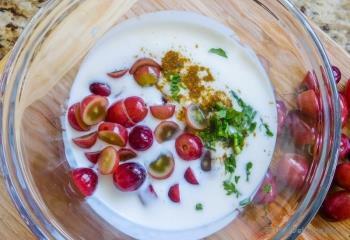 Sweet Grape raita balances the spicy flavors very well. I was just putting together some pita pockets with falafel and tzaziki. This indian twist is such a cool idea! Thanks, Bach! Pita or Naan pockets are best to make flat bread sandwiches! I've never had a naan pocket before! This is such a great idea! I love the vegetables in here and I had no idea that Morningstar Farms had an Indian veggie patty! Thanks, Rachelle! 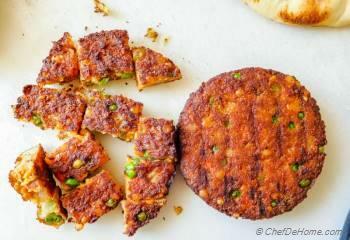 Really, when I saw MorningStar Farms's Indian Patty first-time, I was pleasantly surprised. Also, It has very good flavor of Indian spices and is perfect to enjoy Indian food without much cooking! It's so thoughtful of you to always be thinking about your guests that have special dietary needs! This recipe looks and sounds amazing! So much flavor! Keri, thanks for such kind words. I'm pleased you like the flavors in these Naan Pockets. These look fantastic, Savita! I love the use of naan pockets. Delish! Thanks, Gayle! Naans Pockets go perfect with Indian flavors! very interesting recipe Savita, love all the flavors that you have used in these naan pockets. I am sure this will a big hit at any party!